Today I’m going to reveal a powerful secret that could boost your dividend income 4X. 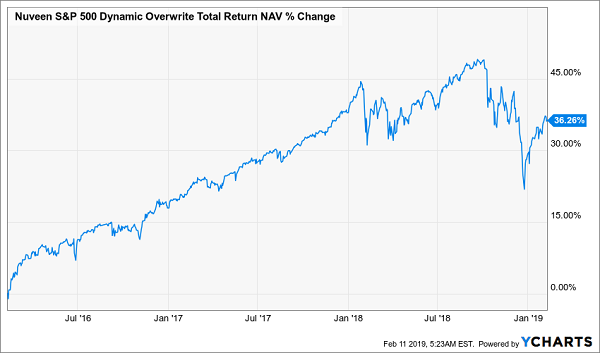 I’m talking about a massive 7.5% income stream here (or nearly 4X the yield on the average S&P 500 stock)—and your capital will grow nicely while you pocket your dividend cash, too. Solid payouts like that put financial independence within reach, because with just $500K invested, a 7.5% yield would hand you $3,125 a month in income. That’s higher than the $2,600 the average American makes. And unlike that average American, you won’t have to troop off to work every morning to get your “paycheck.” Plus you won’t have to sell a single stock in retirement to pull this off. You can retire on dividends alone! All you need to do is understand this one chart. 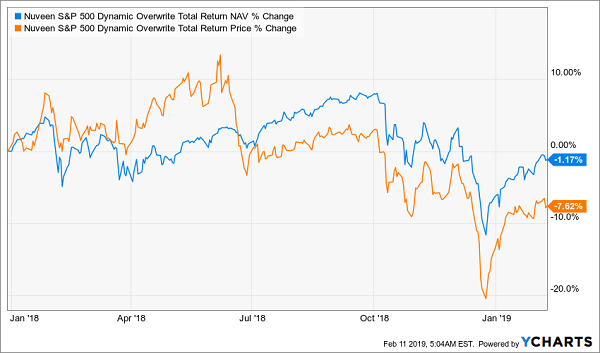 Here we see two lines for the Nuveen S&P 500 Dynamic Overwrite Fund (SPXX), a closed-end fund (CEF) that invests in the S&P 500 while also using “insurance” on its portfolio to limit potential losses. That insurance is in the form of call options sold on the portfolio, which provide a cash flow from buyers of those options that helps offset any potential losses from a sudden dip in the stock market. This fund pays investors an annual dividend of 7.5%, potentially unlocking the financial-independence reality for many people. Now let me explain why this chart is so important. 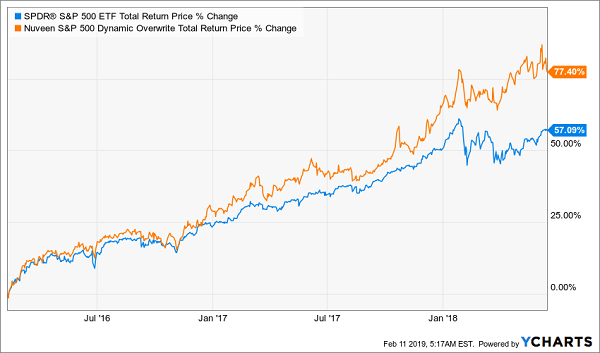 You see here two lines: the blue one tracks the value of the investments the fund holds (known as its net asset value, or NAV), while the orange one tracks the fund’s market price—the price it goes for on the stock market, where it can be bought and sold like any stock or ETF. 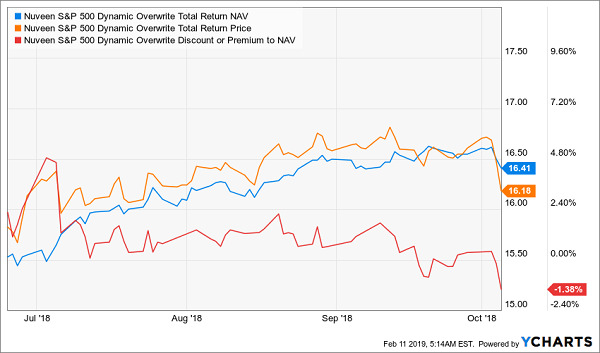 As a result of this trend, the fund’s market price went below the actual value of its portfolio—its NAV. As a result, SPXX began trading at a discount. SPXX trades at a discount most of the time, but sometimes it trades at a huge premium. For instance, it traded at a discount for most of 2016 and 2017 before spiking to a wide 15% premium in mid-2018. Many CEFs do this regularly. Of the nearly 500 funds tracked by my CEF Insider service, more went from a premium to a discount during 2018 than at any other point over the preceding three years. That created opportunities for investors to get assets for less than they were worth, while locking in huge income streams that could keep these savvy buyers financially independent. Plus you can limit your downside by building a diversified portfolio of CEFs that invest in stocks, bonds and real estate. That lets you secure a 7.5% (and potentially even higher) income stream while you take advantage of these occasional mispricings to further boost your overall returns. And SPXX is offering us just such a mispricing now. 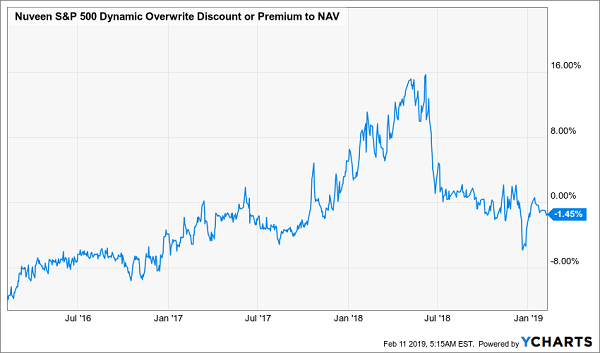 While SPXX’s NAV is down about 3.6% from when the fund’s market price peaked in mid-2018, its actual market price is down a whopping 17.9%. What happened? Investors increasingly realized this fund was overbought and got out—but SPXX’s portfolio performance remained mostly on track. 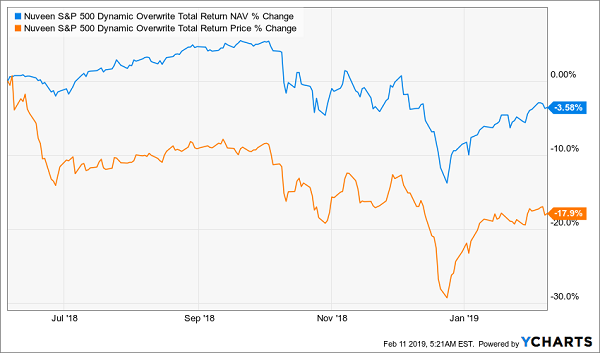 Although SPXX’s NAV took a hit when the entire market did in late 2018, it has also begun to recover, just like the market has, which means the fund’s portfolio is growing, even as it continues to dish out an outsized income stream to investors. This is the power of CEFs, and it’s why these funds are the key to financial independence. You can download this exclusive list, which gives you full details on 5 cash-spinning funds paying an outsized 8.3% average dividend—more than SPXX pays—when you click right here. Because these 5 funds also trade at absurd discounts to NAV, so we’re looking at life-changing price upside of at least 20% to go with your 8%+ payout as these discounts snap back to normal. Yet this unloved CEF is cheap today, trading at a bizarre discount to NAV (when it normally trades at a premium). The kicker? It boasts an amazing 9.8% cash payout!